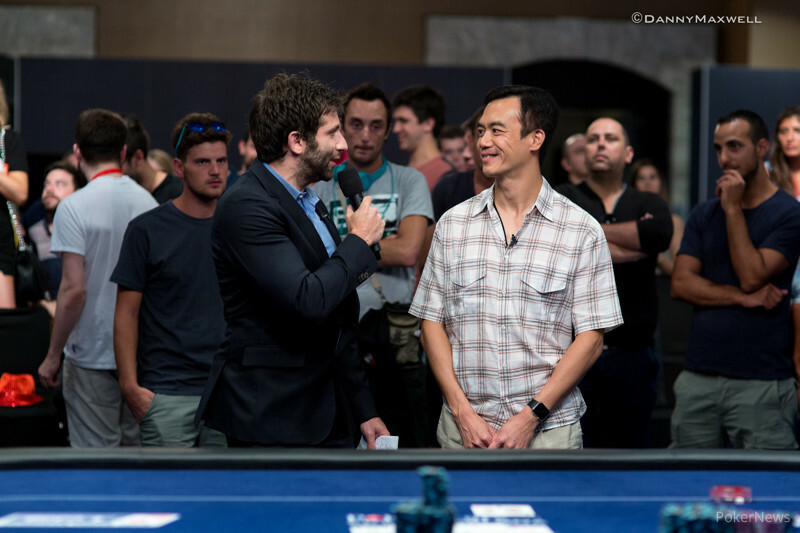 John Juanda Wins the 2015 EPT Barcelona Main Event (€1,022,593)! The biggest European Poker Tour event of all time has been won by one of poker's greatest talents. After a hard-fought battle at a very tough final table, one other than John Juanda defeated a field of 1,694 players to take home the first-place prize of €1,022,593 and his first EPT title. Juanda already had a runner-up finish on the EPT, losing heads up to David Vamplew in Season 7 for £545,000. This epic victory puts Juanda ninth on the all-time money list with over $17 million in career earnings. Here is how it all played out. The final table started with Denys Shafikov as the overwhelming chip leader, and his dominance continued until four-handed play. Shafikov would last for quite a while, but the same couldn't be said for Victor Bogdanov. Bogdanov busted on the very first hand with versus Frederik Jensen's , and the Russian player took home €104,000. A few hands later, Juanda won a massive coin flip with against Andreas Samuelsson's queens to put himself in second place. Mario Sanchez was the next player out when he called Jensen's shove on the river with a straight, but the Danish pro had made the nut flush to send him packing. On the very next hand, it was Amir Touma who got knocked out, as the Lebanese player could not mount a comeback from his last few big blinds. Touma lost with to Juanda's pocket threes and collected €194,100. Not too long after this hand it was time for the Swede, Samuelsson, to take a chance. Unfortunately for him, he chose wrong. Samuelsson ran with off suit into Steve Warburton's aces, and his tournament run ended in sixth place for €253,900. 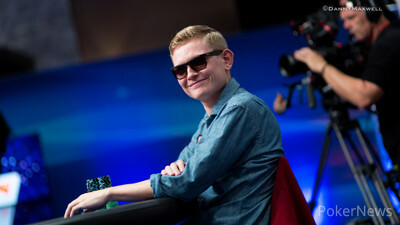 Almost 40 hands later, it was Rainer Kempe who hit the rail in fifth place. Kempe showed some real poise, but in the end the cards did not fall his way. Kempe got it all in with against the of Shafikov, who flopped trip queens. Kempe took home €320,400 and then there were just four contenders left. At this point of the final table, Shafikov regained the lead, and it took a very unlucky situation for him to lose that spot at the top. Jensen ended up all in for his tournament life with tens against Shafikov's aces, and the river brought a narrow escape for the former EPT winner, as the hit. That river card changed everything, as Shafikov was now all of a sudden the short stack. A few hands later, the once dominant Ukrainian hit the rail when he couldn't win with versus the of Juanda. During the three-handed battle, it was Juanda who chipped up nicely, while Warburton was struggling the most. The third player involved, Jensen, was the one who hit the rail, after an epic hand against Juanda. Juanda check-raised the turn, and shoved the river when he hit a full house. Jensen analyzed the hand for over six minutes, and ultimately he decided that his second pair could be good. Jensen called, mucked, and hit the exit, leaving the match between the youngster, Warburton, and the seasoned veteran, Juanda. Warburton was at a big disadvantage, but one double up with against put him right back in it. The young Brit wasn't able to enjoy his comfortable stack for long, though, as he ran pocket eights into Juanda's pair of queens. Juanda celebrated excitedly with Bertrand "ElkY" Grospellier and his girlfriend, as he raised his arms aloft. With that, the 2015 EPT Barcelona festival came to a close. It was an amazing event with records broken at every turn. The next stop will be in Malta in October, and we'll see you there. Until then, goodnight and good luck from the PokerNews team. Hand #223: Juanda found on the button and made it 1.2 million. Warburton picked up in the big blind and bumped it up to 2.6 million. "How much are you playing behind" Juanda asked. Warburton counted his stack as around 15 million and Juanda clarified with the dealer what the raise was for, and then cut some big 250,000 chips from his stack. He eventually four bet to 5.1 million. Warburton announced all in and Juanda snap called! "Oh sick!" Warburton said when he saw the showdown. Bertrand "ElkY" Grospellier all of the sudden showed up on the stage to support Juanda. Warburton's rail was a lot bigger though and shouted as hard as they could for eights and other cards that would connect with his hand. Warburton asked for an eight but wouldn't get it. The on the turn was a blank and so was the on the river. Juanda and Warburton talked about the hand they played late last night where Warburton talked Juanda into folding kings preflop. Warburton admitted to having had but as Juanda said; "It worked out for the both of us in the end!" Hand #219: Juanda made it 1.2 million with and Warburton folded. Hand #220: Warburton with the limped in on the button. Juanda found and raised it up to 1.9 million and Warburton folded. Hand #221: Juanda opened to 1.2 million with . Warburton found a suited broadway hand of his own with and called. The flop came giving Warburton a gutshot and both players checked. The on the turn saw Warburton bet 1.4 million. Juanda folded. Hand #222: Warburton with made it 1.3 million from the button. Juanda found and called. on the flop and Juanda checked. Warburton bet 1.1 million and Juanda called with his gutshot. The hit the turn and Juanda made his straight. Both players checked and completed the board. Both players checked and Juanda showed his straight. Warburton smiled and mucked. A 20-minute break was scheduled but the players quickly agreed to make it a 5-minute break. The staff informed them they needed at least 10 minutes as the 25,000 chips would be raced off, and so it was decided to be a 10 minute break. Hand #215: After unknown action the board showed when Steve Warburton checked and John Juanda checked behind. The river was the and with 4.1 million in the middle Warburton bet 1,675,000. Juanda called right away and won the pot with his pair of nines. Hand #216: Steve Warburton raised from the button to 1,000,000 with and Juanda folded. Hand #217: John Juanda raised from the button to 1,000,000 with and Steve Warburton moved all in with for 11,575,000. Juanda called, and the showdown went as following. The board ran out and Warburton doubled up to 23,250,000 while Juanda was left with 27,330,000. Hand #218: Warburton with on the button made it a million. Juanda had just the showing and three bet to 2,750,000. Warburton called in position. on the flop and with at least top pair, Juanda bet 3.2 million into 5.6 million and Warburton folded. Hand #211: Steve Warburton limped in with on the button. Juanda checked his . The flop came and Juanda checked with his second pair. Warburton checked behind. The hit the turn and Juanda bet 700,000. Warburton folded. Hand #212: Juanda on the button with raised it up to a million. Warburton in the big blind called with . The flop came beautiful for Warburton with . Warburton checked and Juanda bet 800,000. Warburton check raised to 1.8 million and Juanda folded. Hand #213: Warburton with on the button limped in, Juanda checked . The flop came and Juanda checked his bottom pair. Warburton checked behind. The hit the turn and Juanda bet 600,000. Warburton called. The hit the river and Juanda check folded to Warburton's 1,000,000 bet. Hand #214: Juanda made it a million from the button and took down the blinds and antes. Hand #215: Warburton found on the button and he bumped it up to a million. Juanda in the big blind called with . The flop came and both players checked. The on the turn made Juanda bet 800,000 into 2,100,000. Warburton wasn't ready to say goodbye to his ace-ten high. The hit the river and both players checked, leaving the pot to Warburton. 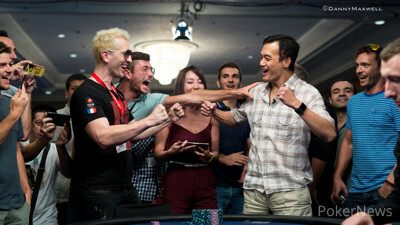 Hand #206: John Juanda raised from the button to 1,000,000 with and he won the pot. 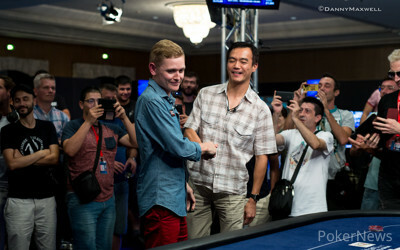 Hand #207: Steve Warburton raised from the button to 1,000,000 with and John Juanda called with . The flop brought out and Warburton won the pot with a bet of 900,000. Hand #208: Juanda limped on the button with and Warburton raised all in from the big blind with . Juanda folded quickly. Hand #209: Steve Warburton limped on the button with and Juanda checked his . The flop brought out and Warburton bet 700,000, which was enough to take the pot. Hand #210: John Juanda raised from the button to 1,000,000 with and Steve Warburton moved all in with . Juanda folded right away. Hand #202: Juanda made it 1,000,000 from the button with . Warburton in the big blind called with . The flop came and Warburton check folded to Juanda's 800,000 bet. Hand #203: Warburton with the on the button limped in. Juanda with checked. The flop came and Juanda checked. Warburton bet 700,000 and Juanda called. The hit the turn and Juanda checked once more, Warburton followed suit this time. The fell on the river and Juanda bet 900,000 into 2,500,000. Warburton folded. 84 big blinds for Juanda versus 15 big blind for Warburton. Hand #203: Juanda made it 1,000,000 from the button with and Warburton folded. Hand #204: Warburton with on the button announced all in. Juanda with folded. Hand #205: Juanda limped in with . Warburton in the big blind with moved in for 8.1 million and Juanda folded. Hand 44: Juanda Rivers an Ace to Double! Hand 22: Rainer Kempe Triples Up!